← Have you lost your Chihuahua? 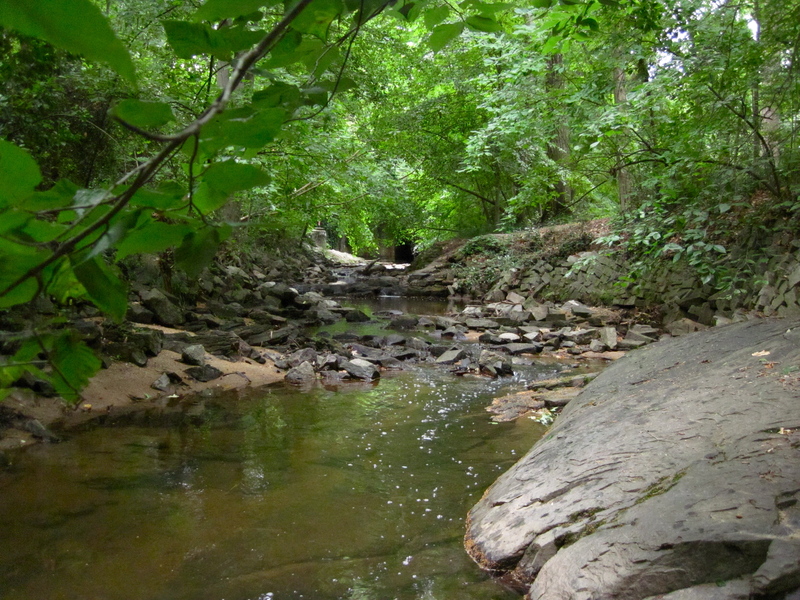 How well do you know the little creek that runs through our neighborhood? Why is it so small? Where does it go? Do you know where you see it again once it leaves the Parkwoods? I work on river and stream issues in the Southeast in my job as a biologist at EPA, and over the years I’ve gotten to know our little stream, as I’ve used it to teach local school kids about stream ecology. I find that I am always intrigued by how interesting a little stream can be — and how much we may not know about it! 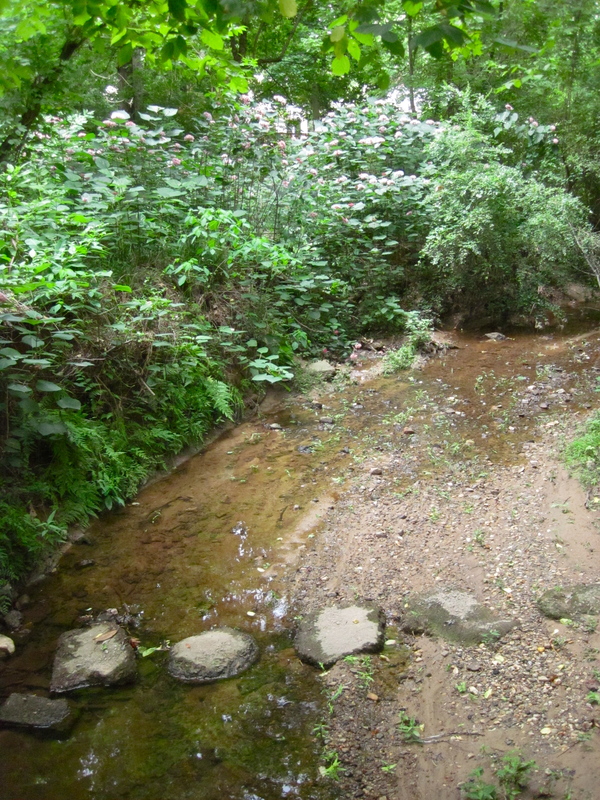 For starters, I find that this stream, in particular, is interesting simply based on where it is located. 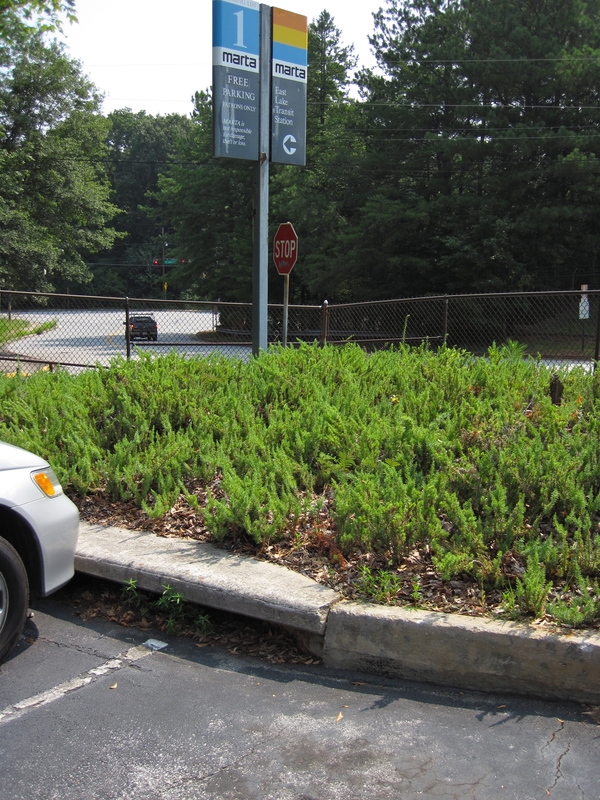 If you drive along DeKalb or College Avenues running parallel to the MARTA and CSX Railroad tracks, you are actually driving along a ridgeline — the highest point that divides different drainage systems or watersheds. (Railroads are often located along ridgelines to minimize altitude changes for the trains, so they almost always denote differing watersheds. So, when you hear the old expression that someone comes from “the other side of the tracks,” it will often mean that they are in a different watershed. This is hugely amusing to stream biologists!) This particular ridgeline, though, is actually a very significant one — it is the Eastern Sub-Continental Divide. The Eastern Sub-Continental Divide separates the watersheds that drain to the Gulf of Mexico from those that drain to the Atlantic Ocean. The Divide runs in a line from the Twin Tiers of New York and Pennsylvania along the Appalachian Mountains to the tip of Florida. It runs straight through Georgia, primarily North to South, but here, it temporarily goes East-West. The city of Atlanta sits right on top of this Divide. So what does that mean for our little creek? The significance of the location of the Divide to our neighborhood, is that our creek is a “headwater” — or the very beginning of the watershed, closest to the ridgeline. Our Parkwood neighborhood has the distinction of being the very first steward of these waters as it begins its journey to the coast. ...where it settles, filters, and feeds culvert #2 draining under East Lake Dr.
After the stormwater retention area, the water goes under East Lake Drive and emerges into our neighborhood back and to the right of the Schwartz-Goldowski home at 258 E. Parkwood Road (photo). 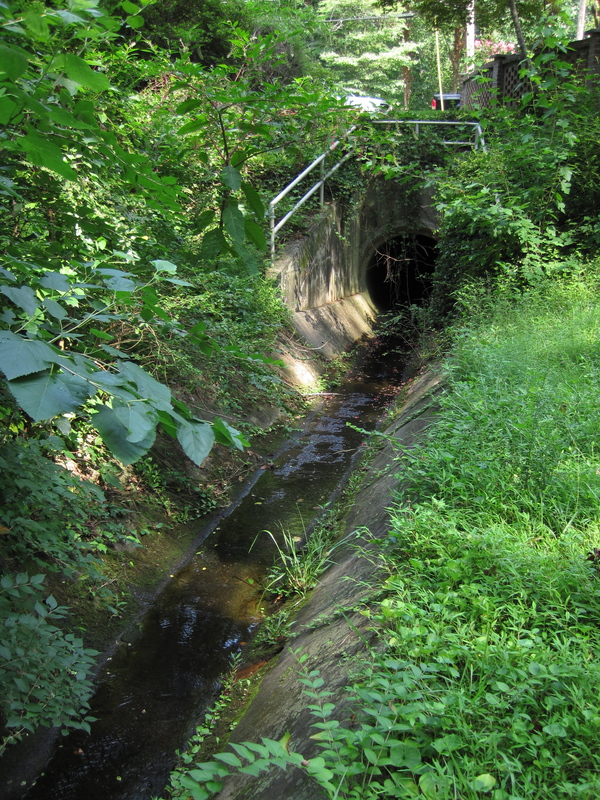 From the sidewalk, you can look up and see the creek coming towards the sidewalk via an open culvert (photo) and then go under E. Parkwood Road. If you stand on E. Parkwood near the round man-hole, you can hear the creek as it goes under the road. Our creek flowing north toward culvert #3 under E Parkwood Rd. 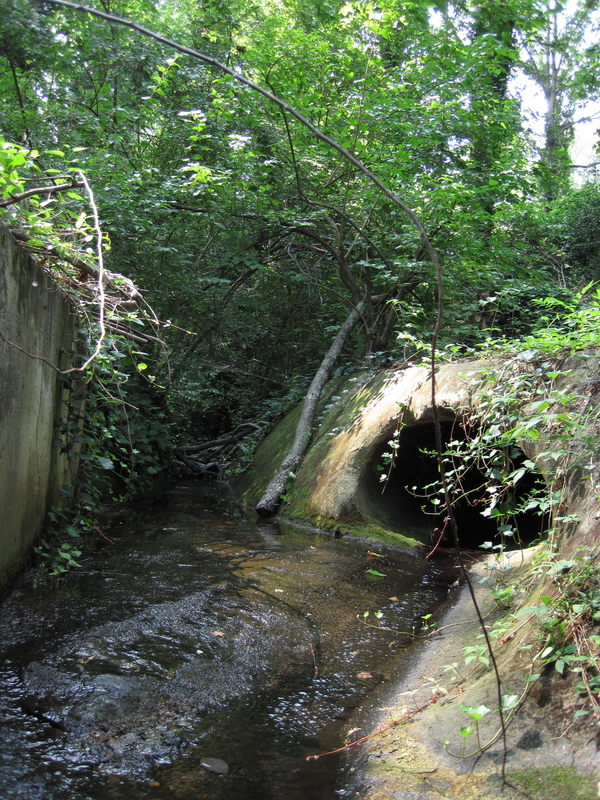 Entering culvert #3 under E Parkwood Rd. Finally, it emerges between the houses on E. and W. Parkwood Roads. 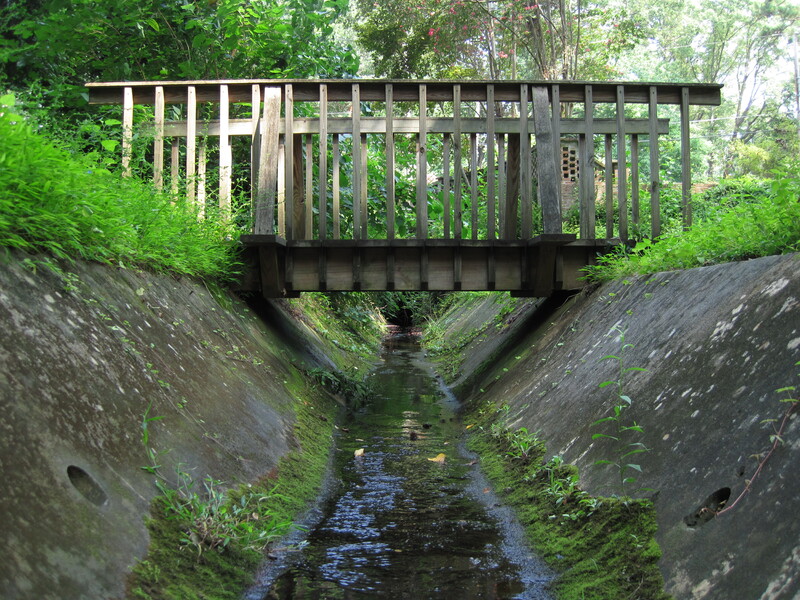 It flows along behind the houses, then it’s back under the road and into the Parkwood Park (photo). So, before it even gets to our Park it has gone through quite a bit of hydrologic alteration, including four under-road culverts. So where does it go once it leaves our neighborhood? From the Park it goes north under W. Ponce, under Scott Blvd, and then runs along the eastern side of N. Parkwood parallel to the railroad tracks. At the end of N. Parkwood, it curves west. If you are out on a long walk, go to the very end of N. Parkwood where you’ll find a log-lined path on the right. 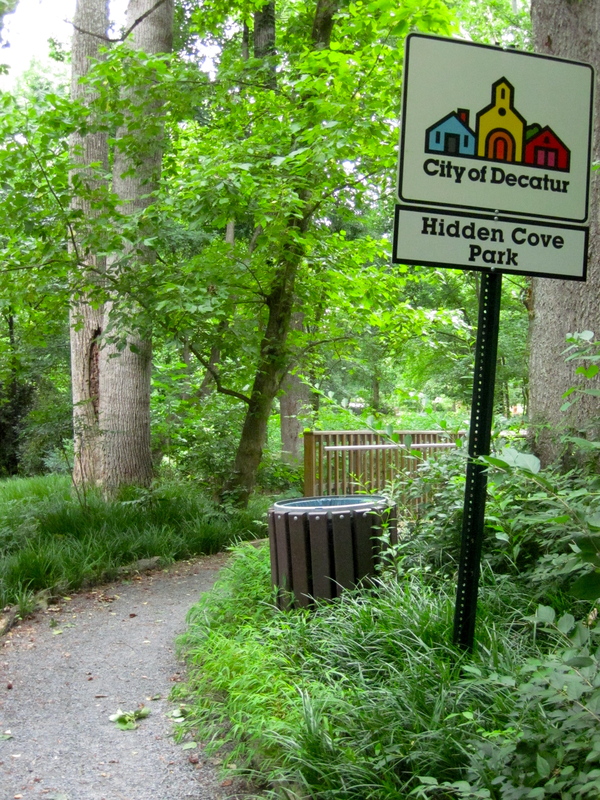 Follow it into the City of Decatur’s Hidden Cove Park. 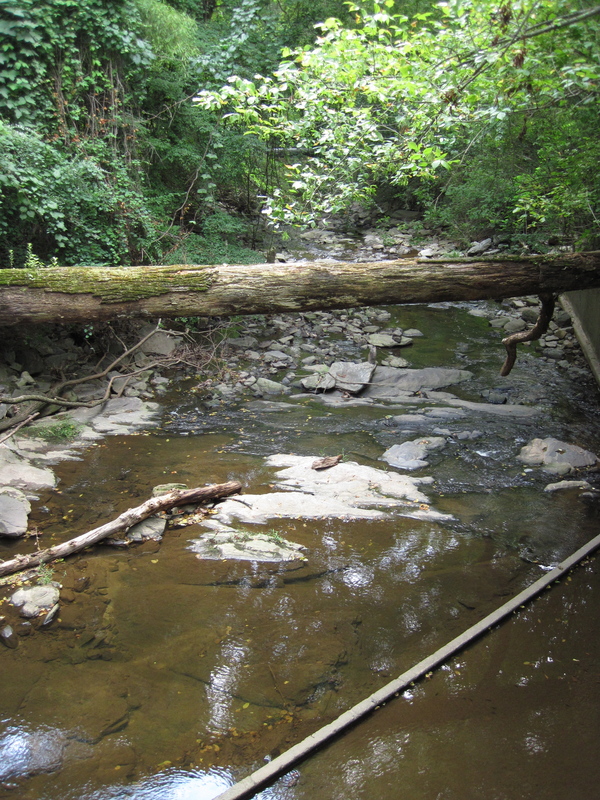 You’ll cross a bridge and see our creek underneath (photos). 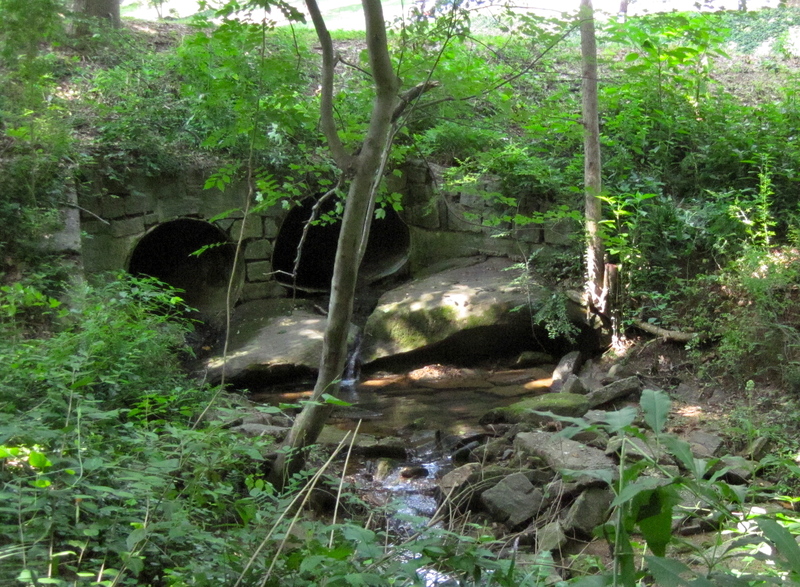 Decatur's Hidden Cove Park at end of N Parkwood Rd. 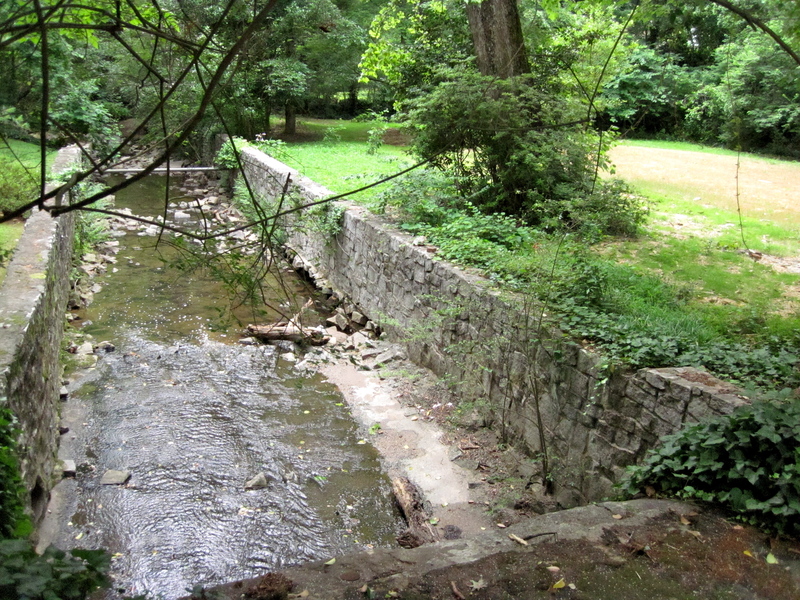 Walk along the trail to see the convergence with a small creek, which originates near the former Westchester Elementary (photo). 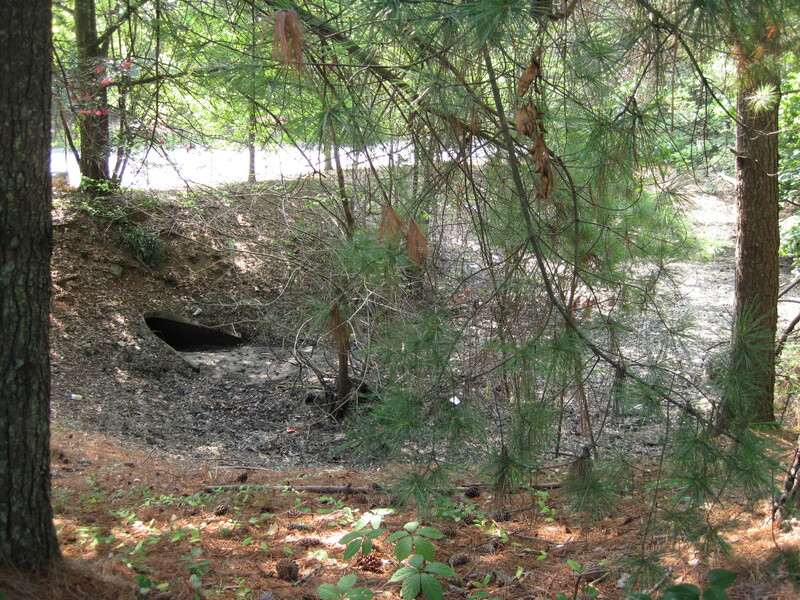 (Both here and at Hidden Cove Park, you’ll also see an official sign indicating that high bacteria levels have been found in the creek as well.) The creeks join together, cross under the tracks and then splash over the beautiful waterfalls on The Falls Ct off of Chelsea Cir. If you’ve ever had the pleasure of seeing the McConaughey home on one of the tours, it is our little creek that drops beautifully over the Falls and into their backyard. If you have not seen the Falls, then the most likely time for you to see our creek again is when it crosses under Vickers Drive at the very bottom of the big hill. 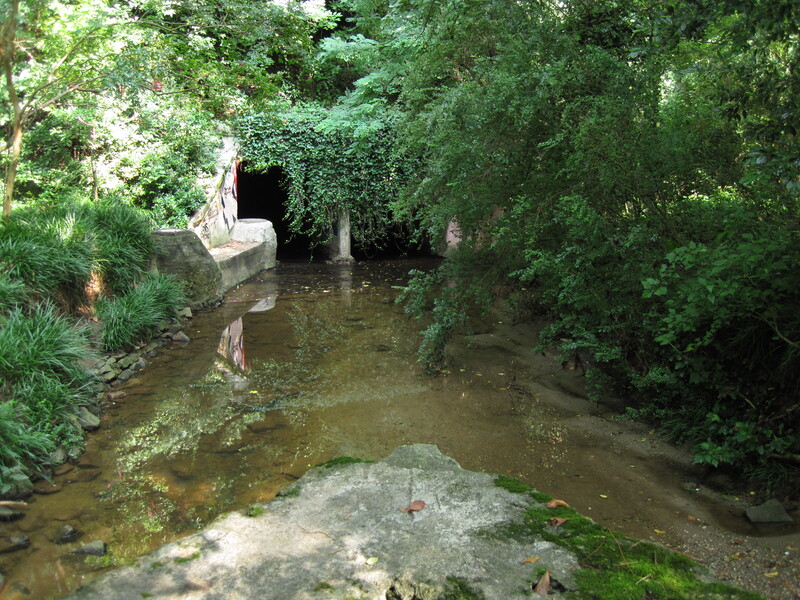 At this point, the creek is officially considered to be Peavine Creek (photo). 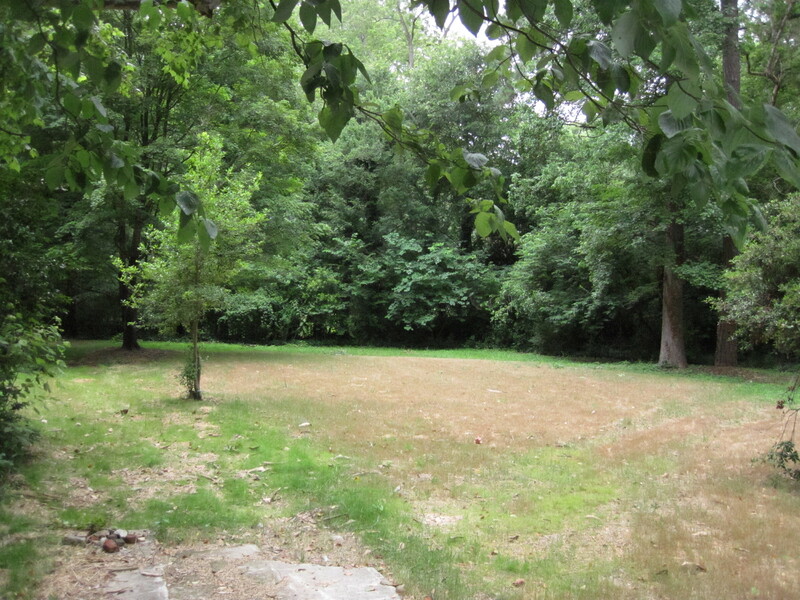 Cleared floodplain adjacent to Peavine Creek on Vickers Dr.
Peavine Creek then runs between Ridgewood and E. Clifton Road, crossing Clifton near Oxford, visible at the beautiful new Burbank Park near Saba’s and Dominos (photo). 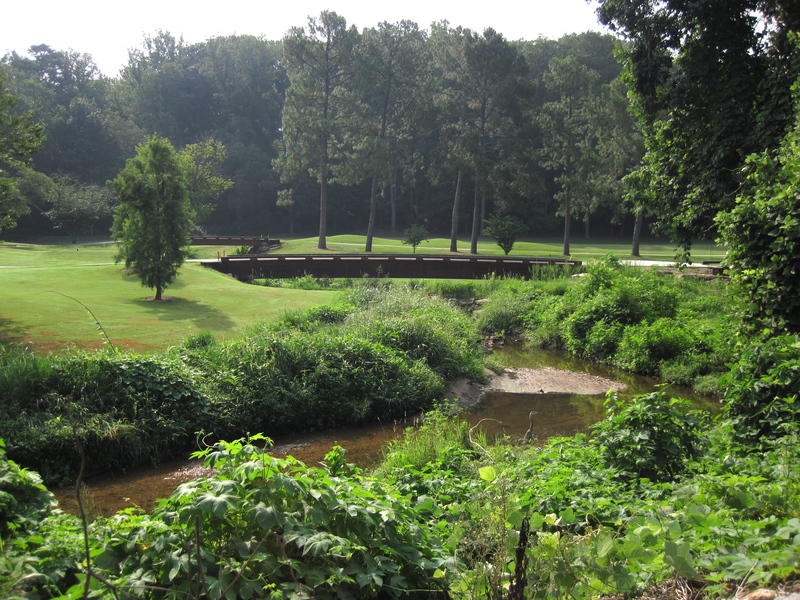 Before it crosses N. Decatur Road near Dave’s Cosmic Subs, it joins with Lullwater Creek (which has just emerged from the Druid Hills Country Club) (photo). 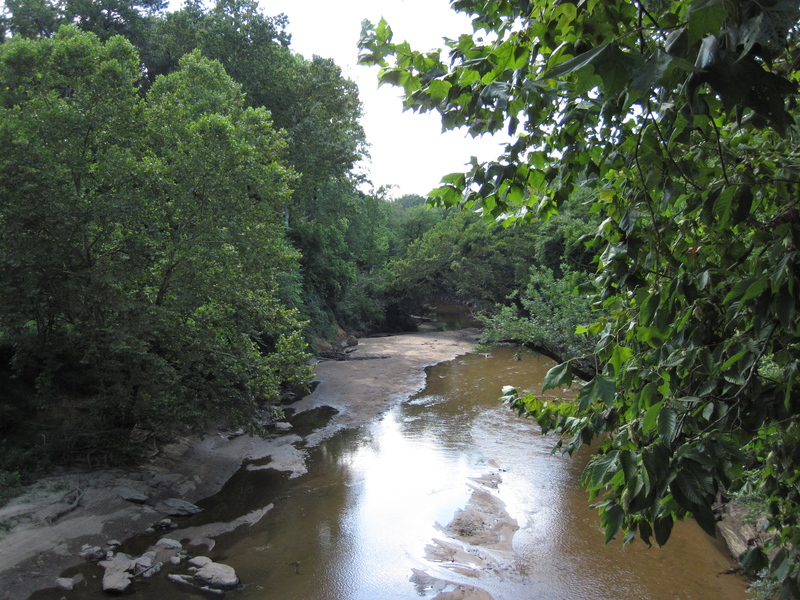 The North and South Forks of Peachtree join to become Peachtree (photo), which then flows into the Chattahoochee River (photo). 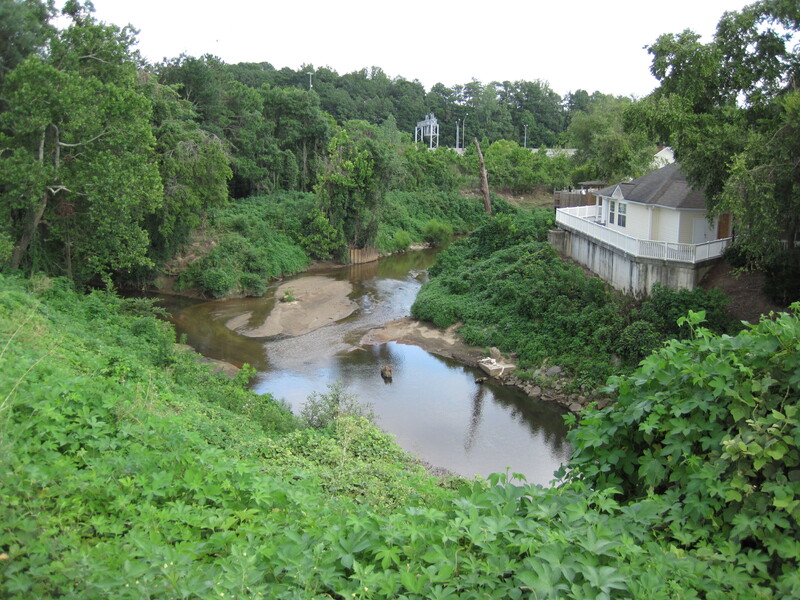 The Chattahoochee, our source of drinking water and where our waste water discharge goes, becomes the Alabama-Georgia border. At the southwestern Georgia border, the Flint and Chattahoochee join to become the Apalachicola River, which flows into Apalachicola Bay. As you play in the surf of the panhandle — know that our little creek ends up there. So, you all know your street address — now you know your watershed address: You live on the headwaters of Peavine Creek in the Peachtree Creek watershed which flows into the Apalachicola/Chattahoochee/Flint — or ACF — River Basin. Now, for our neighbors with children at Oakhurst, Renfroe, and Decatur High…do you know the watershed address of your school? I’d be happy to map it for you should you want to know. Hope you enjoyed reading installment #1 of this new series on our creek’s health and natural history, to be continued by Lisa Gordon and Rebecca Kerimbaev. Lisa’s been an environmental scientist for EPA’s Southeast Regional office for 23 years, working on rivers, streams, lakes, and estuary issues for the past 18 years. Right now, she’s working on a special project about addressing the effects of altered hydrology, including effects of stormwater, impoundments, dams, surface water, and groundwater withdrawals on stream ecology. For the next installments about our creek, Lisa hopes to write about aquatic critters and about what neighbors can do to protect the health of the creek and the downstream waters. Stay tuned! Rebecca Kerimbaev is a Georgia Adopt-A-Stream quality assured volunteer who’s received Chemical QA/QC Certification and will conduct monthly chemical and biological monitoring of our creek within Parkwood for the next year. She started collecting water quality data from four monitoring sites in June 2011 and will report results to the neighborhood as trends become visible over time. This weekend she’ll attend the Biological Monitoring Workshop for Quality Assurance in order to begin biological monitoring of our creek. This entry was posted in creek, History, neighbors. Bookmark the permalink. I have to say that I found this post fascinating. I never gave the stream two seconds of thought until I read this article. Thank you for sharing this. I look forward to when my son is old enough to take him on a little trip to “discover our stream.” We’ll use this as our map. Thank you! I look forward to Installment II. I am extremely late in reading and responding to this wonderful article. I just wanted to mention that in about three of the pictures where it shows the beginning of Peavine Creek (the pictures refer to a home being taken down at the base of Vickers Drive), the home that was removed there belonged to my grandparents, Louie and Sara Mann. They lived for over forty years in that home and dealt with MANY flooding issues over the years, and also invited many Fernbank students to come and enjoy the natural environment that was their home. Anyway, it brought tears to my eyes to see this all put together so thank you for sending this out! Thanks, Lisa, for this very informative article. We’re so fortunate to have an expert like you in our neighborhood!